John and I recently upgraded our mattress from a queen to a king, and boy oh boy, it was a fabulous decision! Along with upgrading our mattress, we had to buy all new pillows (did you know there are pillows specific for a king? I had no idea! ), new sheets, duvet, etc. All of the purchases added up quickly, so I thought I would try to save some cash by trying my hand at a DIY headboard. I love the look of riveted headboards, but they are quite expensive... the upside? They are super easy to make! And I've got to be honest, a lot of my DIYs involve John doing a lot of the heavy labor, but despite how this DIY looks, it is quite simple, and I completed it on my own in a single evening! All in all, this DIY can be completed for under $75 (depending on the fabric you choose, etc. ), which is quite a savings considering what they retail for! 1. Begin by cutting your plyboard to the correct width of the bed (a traditional king is 76 inches wide). If you purchase your wood from Home Depot or Lowes, they will cut it for you for free. 2. Cover the plyboard with the quilt batting (I used four layers of batting... which equaled 3 packages of queen sized batting). Between each layer of batting I used an adhesive spray to make sure the batting would not slide around and get bunchy once it is mounted. 3. After the quilt batting is covering the plyboard, flip the board over and tightly staple the batting to the back. 4. Once the batting is stapled, cover with your fabric and staple the fabric to the back. For my fabric, I used an IKEA curtain that matched the curtains that we have hanging in our room... it was the perfect size (and price)! 5. 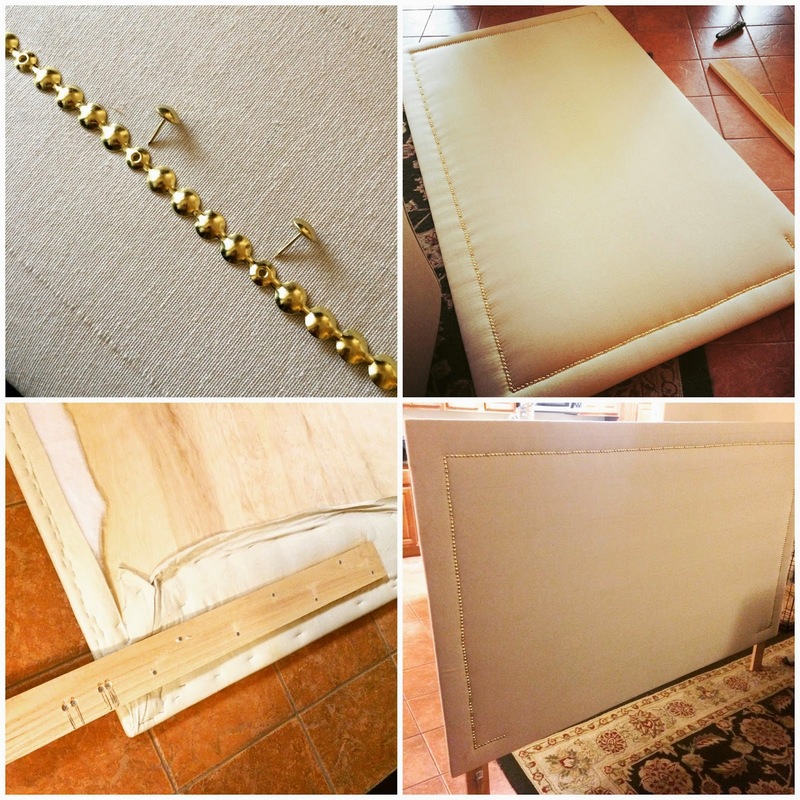 Once all of the fabric is tight and secure, start riveting your headboard. I purchased my rivets from JoAnns and only needed one roll. The rivets I purchased only required every fifth stud to be hammered in which was pretty convenient, and still looked great. 6. Finish riveting the perimeter of the headboard. There will be a slight tuft where the rivets are secured to the board. Everyone asked me if this part was difficult, but actually it was my favorite part - it only took about an hour (maybe a bit longer) total. 7. After the rivets are finished, secure a 1x4 to each side of the headboard. My bed frame has mounting brackets for a headboard, so I had to measure the distance between my 1x4s, but if your bed does not have a mount, then you can simply put the 1x4s on either side of the headboard. 8. 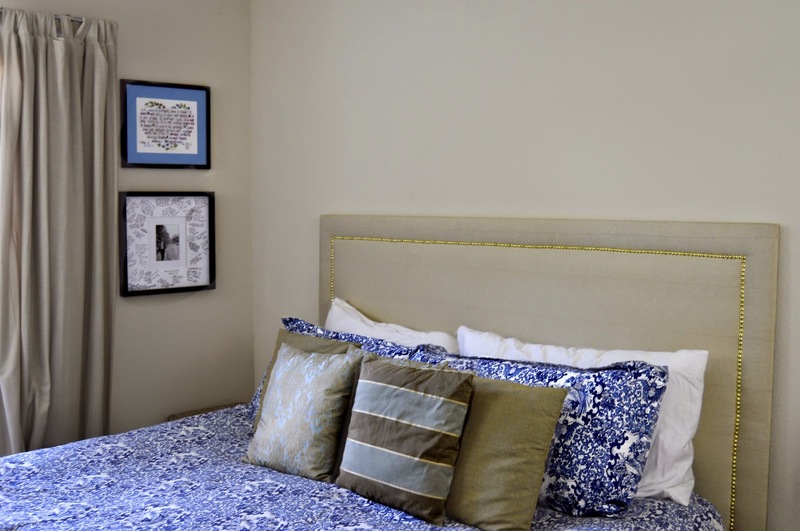 Finish the headboard by mounting it to your bed frame or securing between the wall and your bed. Ta da, it's that simple! I'm very happy with how it turned out... and especially for the price point! I really like it! You did a great job! My husband I really want to make our headboard, but we are waiting till we buy a house and see what the new space calls/allows for. Gorgeous! You did such a good job on this! I love the beautiful blue printed linens and pillowcases too! Love how it turned out! Awesome DIY! So cute! Great job, Lisa! That looks like something straight out of a showroom floor! Oh my word!!! This is gorgeous!!!!! Great job, and what a great price! 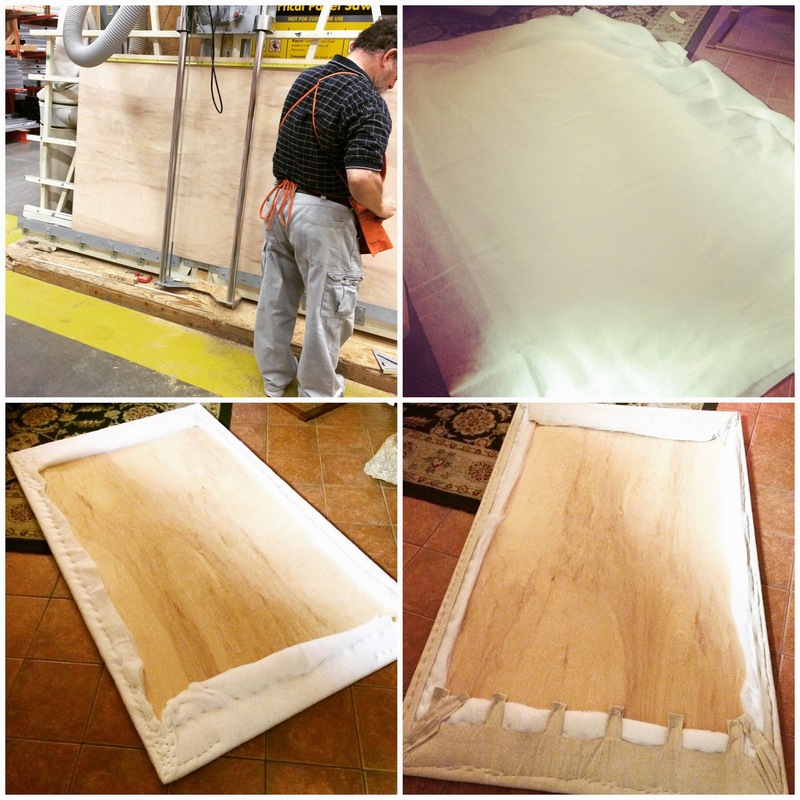 We are upgrading from a queen to a king this summer and I want to make a custom headboard. Thanks for the great step by step guide! It looks great! I love this! I was just saying recently that I'd love a new headboard, this might be a little 2015 project :) Gosh yes, king size is the way to go! The studs totally "made" this! I love how it turned out and you just saved oodles versus what Pottery Barn would charge. Great job! This looks so amazing! We need one for our guest bedroom and I'm tempted to give this a try but a staple gun kind of scares me! And can you even rent one of those things? Wow, very impressive - you are truly the DIY queen! we got our king delivered yesterday and makes a CRAZY difference! and thanks for the "king pillow tip" i had no idea either! This is an amazing DIY! You do not even know how perfect the timing of this post is! We got a king last year and are in need of a headboard but don't want to spend a ton. We are going to do this once we have the time!!! Thank you Lisa! So cool!! Looks amazing and seems so easy! Girl...you never cease to amaze me. This looks incredible! Love this DIY! 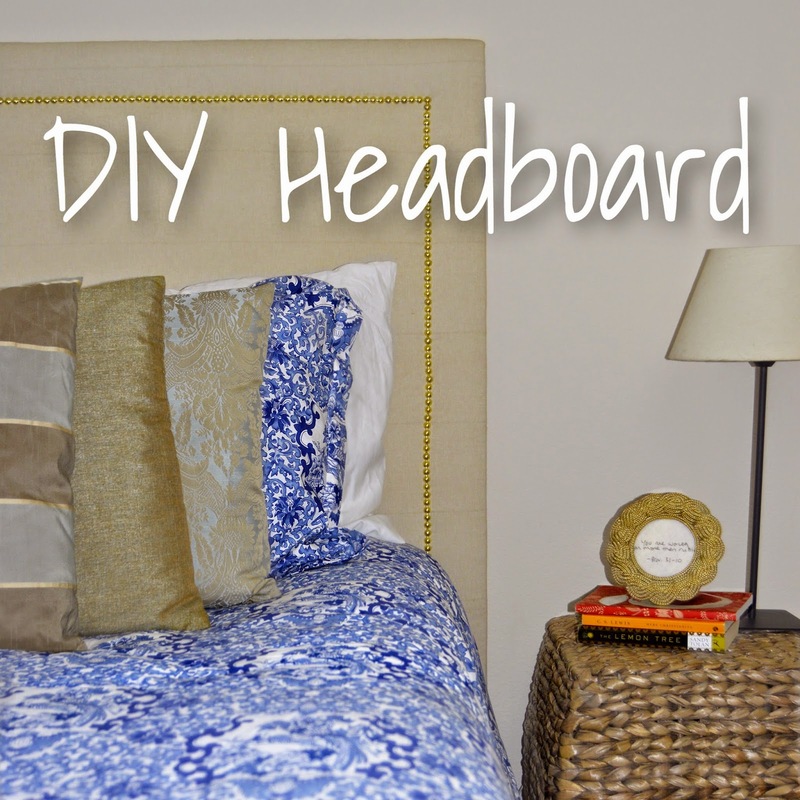 We have a DIY headboard as well. What a fun project! This is so pretty! Thanks for stopping by and linking up with me! This is gorgeous! It turned out so well! How awesome! I love it!!! I'm definitely pinning this! Oh my gosh, I love it! What a great idea to use an Ikea curtain too, the fabric on their grommet panel curtains is so nice and sturdy, which is perfect for this! You did an amazing job!